The following step by step tutorial is going to show you how to convert DVD to MP4/MP3 for playback on all sorts of MP3/MP4 players using Clone2Go DVD to MP4 Converter for Mac. Download the latest version of Clone2Go DVD to MP4 Converter for Mac, install and run it. Click the "Open DVD" button to load the DVD movie you are going to watch on your MP4 player. After the movie is imported, there is a list showing each DVD chapter/title. From the table, you can know about the Name, Duration, Video Size, etc about the DVD movie. Note: Check out the longest DVD chapter/title, which is usually the main content of the DVD movie. Go to the "Output" panel. Click the "Profile" drop-down list to choose the output format. 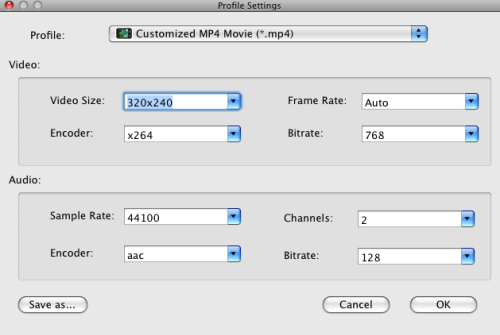 To convert DVD to MP4 on Mac, choose the "Mp4 Video" category from the list. From the subcategory, choose "Customized MP4 Movie (*.mp4)" if you want to convert DVD to video file for viewing on your MP4 player. After making all necessary settings, click the "Convert Now" button to start to convert DVD to MP4 on Mac. There are a few Tips and Tricks while using this DVD to MP4 Converter for Mac to rip DVDs to MP4/MP3 for playback on MP3/MP4 players. Clone2Go DVD to MP4 Converter for Mac works as a Free YouTube Downloader + Converter as well. Click the icon in the program interface. Then you can start to download and convert YouTube videos in the pop-up "Clone2Go YouTube Downloader" window. Learn more about how to download and convert YouTube videos with Clone2Go Free YouTube Downloader for Mac. Method 1. Specify the "Start Time" and "Stop Time" under the manager panel within the accuracy of second. Method 2. Trim the movie while previewing it. You can click the "Trim Begin" and "Trim End" buttons to get the certain part of the movie/video while playing it back. If you fail to find the most appropriate output format from the "Profile" list for your player, you can click the "Customize..." button next to it to customize a profile. In the following "Profile Settings" Window, you can adjust Video Size, Frame Rate, Encoder, Bitrate; Audio Sample Rate, Channels, Encoder, Bitrate, etc to meet your specific needs. 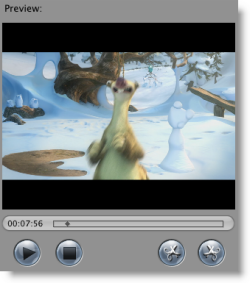 A common DVD movie has several DVD subtitles and audio tracks. You can select any available DVD Audio Track and Subtitle to convert. Just extend the "DVD Audio" and "DVD Subtitle" drop-down menu and choose your favorite audio track and subtitle. Note: If you want to remove DVD subtitle, just select "None" from the drop-down list. Likewise, if you want to rip DVD without audio, you just choose "None" from the "DVD Audio" menu.